Almost all motorcyclists will wear glasses or goggles at some time when riding a motorbike, whether to correct vision, dull the bright sun or protect the eyes. Before you purchase a pair of glasses, though, you’ll need to make sure that they fit within your helmet and also are comfortable while wearing your helmet. Some helmets have a pre-cut groove in the padding along the temples where the glasses’ arms can sit so that the helmet doesn’t force the arms against the temples and behind the ears which can be quite uncomfortable on a long trip. Glasses specifically designed for helmet use often have padded arms, usually a neoprene or foam. Softer padding doesn’t last as long (especially if you let it get wet or dirty) but will be more comfortable in the short term. If the helmet doesn’t have pre-cut grooves, grooves will eventually form over time as you wear your helmet with the glasses. This might mean that a small amount of discomfort initially could become comfortable over time, like buying a new pair of shoes. You can purchase removable eye cups to keep glasses frames off your face. Shown on the left is a removable AirShield from 7eye. 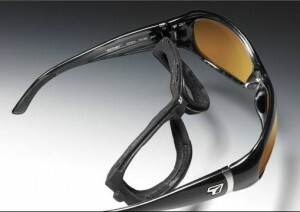 They are supplied specific to certain glasses designed for motorbikes. Glasses with large lenses might not fit under the helmet. If they are pushed down by the padding over the brow or around the cheeks it will cause discomfort on the bridge of your nose. Lenses not only correct your vision and reduce glare, but they can protect your eyes against flying projectiles. Glasses used when riding should have shatterproof polycarbonate lenses and a lightweight nylon frame. The lenses should provide 100% UV protection as our sun is very harsh. To reduce glare use polarised lenses. Orange or yellow lenses can help improve clarity on dull days. You will need non-tinted lenses for nighttime riding (light yellow tints are OK for nighttime, but not dark sunglasses). Some glasses support interchangeable lenses and these are useful if you have prescription lenses and also want prescription sunglasses. The sunglasses lenses can either clip on (in which case they don’t need to offer any additional correction), or replace the clear lenses. The lenses can fog up easily, especially in a full-face helmet where you are breathing humid air into the helmet, so invest in some anti-fogging products. You can reduce the chances of this by wearing your glasses for 15-30 minutes before using them outside as this will normalise them to the temperature of your head. The arms should not be too thick as they will compromise your peripheral vision by blocking your view sideways. Your peripheral vision is already compromised by wearing a helmet. To get the best fit, you should take your helmet to the glasses vendor and try glasses on while wearing your helmet. Put your helmet on first then put your glasses on through the visor. Make sure that the frames at the top and bottom don’t obscure your view and create extra blind spots while you are riding, for example by blocking your view of your bike’s speedo. Ultimately the best performance and convenience when riding is using contact lenses, or getting laser eye surgery. If you have an open face helmet then you can purchase prescription goggles, or just wear uncorrected goggles for general eye protection. However, an open face helmet doesn’t provide anywhere near as much protection in a crash as a full face helmet. Goggles will keep dirt, wind and water out of your eyes more effectively than glasses. Choose goggles with a comfortable strap and vents to avoid issues with fogging. Worn over a long period of time, goggles can put pressure on your brow and cheeks and the bridge of your nose, leading to discomfort. Goggles can restrict your peripheral vision quite significantly making it more difficult for you to see other vehicles in your blind spots. Why not use a tinted visor? If you are only ever going to use your bike on bright, sunny days with excellent visibility a tinted visor is fine, but they restrict your visibility when light is low at night, in tunnels and when it is overcast. It’s more versatile to have a clear visor and use sunglasses. You should never ride without eye protection. Even at 30kph a stone flicked up from a vehicle coming in the opposite direction could hit your eye at enough speed to blind you. Being hit in the eye even with a small insect will be painful and your instinctive reaction could cause you to crash, particularly if you are mid-turn. Passengers will also need eye protection for their safety and comfort. The best eye protection is a visor, followed by goggles, followed by glasses. Store any eye protection properly so that it avoids scratches. Scratches can affect your vision, particularly during sunstrike. With sunglasses and glasses, check the screws periodically as they can work loose over time and lead to one of the arms falling off, or a lens becoming loose. Clean them as per the manufacturer’s instructions. ‹ Is it safe to use cruise control in the rain? Is it safe to use cruise control in the rain?